In early November, a young man in Myrtle Beach, SC, made the final decision to end his life, no doubt leaving a void of unspeakable loss in the hearts of his family, friends and the Carolina Forest High School community, where he was a ninth grader. 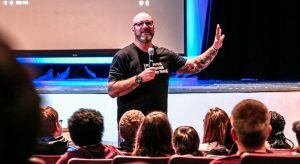 Through the grapevine, word about this heartbreaking incident made its way to youth motivational speaker, author and mental health advocate Jeff Yalden, who was then in Minnesota for a college presentation. Yalden, who lives in Murrells Inlet, speaks more than 200 times a year at high schools, colleges and other venues across the country. Over 25 years, he has presented to more than 4000 live audiences across the globe. But when tragedy strikes so close to home, the ripples through the community are palpable. Yalden reached out to Carolina Forest High School, offering to help in any way he could with the counselors and crisis intervention experts. Instead, Carolina Forest High School invited him to do one of his signature presentations. On Wednesday, November 21, Yalden delivered a hard-hitting and uplifting youth motivational talk in the school auditorium – a variation of his renowned “about life” presentations – covering such subjects as attitude, choices, self-respect and more. “This was not an assembly reflecting on the loss of the student who took his life. This assembly was about who we are, where we are and where we are going,” Yalden said. Yalden said he proudly lives with mental illness every day. Diagnosed with major depression, bipolar II disorder, and PTSD [he served as a U.S. Marine during the Gulf War], he is transparent and authentic in his personal journey with self-care, therapy, and medication. He was featured as a celebrity teen and family life coach on MTV’s long-running reality show, MADE. Yalden is also a suicide prevention expert and crisis intervention specialist. A priority in his messages is to assure young people that it’s OK to ask for help. His presentation Tuesday was meant to inspire and encourage the students – most of whom were ninth graders – as they prepared to leave for Thanksgiving break. Yalden covered three points in his presentation that he feels are very important: Self-value, attitude and choices – a trifecta that plays into his “take time to think” mantra. “In the end, I think the kids appreciated the truth and the humor in a message that they were not really expecting,” he said. Yalden said that mental illness is quickly becoming the biggest public health crisis in this country. Carolina Forest High School counselor Tammy Goodman said that although she wasn’t sure a lot of the students knew what to expect, she felt a different energy from the students following Yalden’s presentation. Yalden handed out copies of his Amazon bestseller, BOOM! One Word to Inspire Action, Deliver Rewards, and Positively Affect Your Life Every Day – as well as motivational t-shirts. Students rushed to the front of the stage to snap them up. Goodman noted that the auditorium was full of students from all walks of life and from different grade levels. She explained the motivation behind Yalden’s talk. 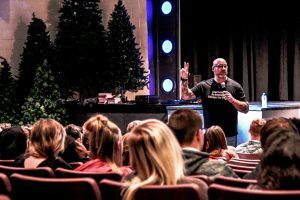 For more about Jeff Yalden, visit www.jeffyalden.com. Check out Yalden’s new nonprofit at www.jeffyaldenfoundation.com. Stay up to date with our latest content!